In October 2012 during a press conference in Paris, Dave Gahan, Martin Gore and Andy Fletcher announced plans to release a new album and a worldwide tour starting from Tel Aviv and continuing in Europe and North America in the year 2013. Martin Gore revealed that Flood mixed the album, marking the producer's first studio collaboration with the band since 1993's Songs of Faith and Devotion. In December 2012, the band officially announced signing a worldwide deal with Columbia Records and releasing a new album in March 2013. 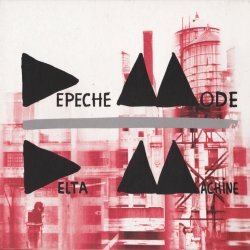 On 24 January 2013, it was confirmed that the album was called Delta Machine. "Heaven", the debut single from Delta Machine was released commercially on Friday 1 February 2013 (although not in the UK). The release date in the UK was pushed back to 18 March 2013 (17 March 2013 on iTunes), currently with no explanation. Bafflingly, the physical release still bore the Mute Records logo, even though the band have now severed ties with their long standing label. Andy Fletcher mentioned in an interview this was due to their "devotion" to the label and with the band's insistence. In March, the band announced North American dates to its 'Delta Machine' summer tour, starting 22 August from Detroit and ending 8 October in Phoenix. In June, other European dates were confirmed for early 2014. The final gig of Delta Machine Tour took place in Moscow (Russia) on 7 March 2014, at Olimpiski venue. In March 2014, Depeche Mode won the award for "Best International Group – Rock / Pop" at the ECHO Awards in Germany. Also they were nominated at the category "Album des Jahres (national oder international)" for Delta Machine, but lost against Helene Fischer Farbenspiel.